"Centrally located in the Best Place to stay in town. Clean & honestly environment for Relaxing Stay." Greenleaf has many year experience on organizing tour, especially in Taman Negara. We have many English, Chinese, Malay speaking nature guides which can bring you maximum understanding and enjoyment throughout the journey. All our guides are highly train and have certification from Tourism Association. 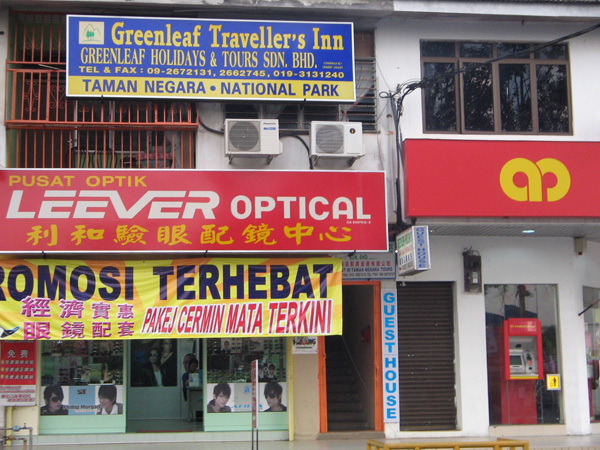 Greenleaf Holidays & Greenleaf Travelers Inn is strategically located in the heart of Jerantut town, the largest district in Pahang, East Coast Malaysia and has many attraction of its own in its hinterland like go caving, fresh water fishing, waterfall, bamboo rafting or even some social golf. Greenleaf Holidays & Greenleaf Travelers Inn is a boon to travelers of all kinds, be they the curious travelers or the tourist. So much to see and do all within easy reach of each other there is something here to everyone. We are within waiting distance to major business and financial centers in the town with convenient accessibility to the bus, taxi and railway services. At Greenleaf Travelers Inn, we offer you excellent value accommodation at budget hostel prices. We offer the very best in comfort, warrant, quality services and great value.